"I tell my research students not to compare their own progress with the progress of the dissertations of their peers, and still, when I received Suzanne's CV, I found myself doing the exactly the same." That is how Professor Peter Ayton, Associate Dean for Research in City's School of Arts and Social Sciences, introduced Professor Suzanne Franks at her inaugural lecture in the Oliver Thompson Lecture theatre. The lecture, 'From Pictures to Policy: Reporting Famine and other Crises', highlighted issues with the reporting of humanitarian disasters. It also summarized points from Professor Franks' recent book, Reporting Disasters: Famine, Aid, Politics and the Media (Hurst, 2013). 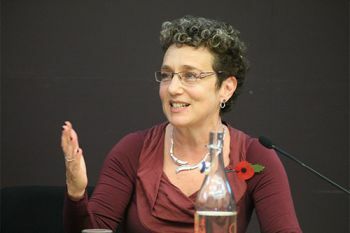 Professor Franks first looked into the media's portrayal of humanitarian crises when researcjing into the BBC's official history for her PhD, but had not published the extensive material behind her research until now. "I am very interested in the relationship between, politics, aid agencies, and the media," she said. "This clip was 'viral' even before 'viral' existed." She pointed out a number of fallacies in the report and examined the ways it was received and acted upon by politicians, NGOs and the public. She also suggested that the problems identified in this particular case could be applied to "many parts of the media"; for example the way stories are simplified and adapted to fit a certain purpose, rather than to convey truth. "The saying 'The journalists goes to where the news is' could rather be 'The news goes to where the journalists are'," she continued, adding that despite the complex situations that might have to be investigated, complexity is always preferable. She cited Syria as an example of a situation where simple "Goodie and Baddie roles do not apply". "Just saying 'let's boil it down to a simple story' does not serve the audience. It is lazy journalism." She compared the situation in Syria with the Biafran war, the first case of "Oh Dearism" - where terrible pictures were published with very little information about the political situation, to try to encourage people to give monetary aid. She proposed that journalists should not stray away from highlighting the political situation in order to try to raise money; aid money actually made the Biafran war last longer than it otherwise would have. "People have to be very wary of this kind of story, that just appeals to the heartstrings but shies away from complexity." She assigned the media a greater role in the construction of disasters. "If the journalists do not report them, they practically do not exist to our part of the world," she said. "I was actually talking to the students in the audience a lot the other day - don't be lazy, ask awkward questions and try to tell a proper, nuanced, fully-fledged story." Professor Franks hopes that From Pictures to Policy: Reporting Famine will change the way her audience see the news in the future. She said: "One of my friends told me that she was going to watch the news much more critically from now on, and that is what I wanted." The inaugural lecture marks the beginning, or at least an important step, in Professor Franks' career at City University London and the academic world, even if she is still adjusting to the transition between broadcast and higher education. "It is sometimes amusing, the different approaches and paces," she said, laughing. "It was a bit challenging at first." She gave her lecture to a diverse audience, who filled the majority of the 350 seats in the theatre. The last quote of the lecture was one that the audience should carry with them: "We cannot simplify. We need to engage with the politics, because that is all we have to make sense of how to actually make a difference."